Somewhere on the internet, there’s a riff or two on what happened to Calvin when he grew up. They’re usually mawkish, but understandably so, because Bill Watterson’s Calvin & Hobbes somehow managed to mask its brutal honesty about childhood under a layer of cute. The strip was brilliant, striking chords for both the sentimental and the cynical. There’s room for both sides — whether it be a story of the last days of Calvin (you’ve seen that one) or the takedown on Seth Green’s Robot Chicken with a horrific ending. But both sides miss the center, the difference between having an imaginary playmate and needing one. Writer David Pepose and artist Jorge Santiago Jr. offer their response with Spencer and Locke, a tale of what might happen if a boy like Calvin grew up in Frank Miller’s Sin City. So it’s not for those who think of the strip in cloying terms — and I don’t judge you — but if you give it a read you see the affection and understanding for Watterson’s work that drips from each page. That’s not to say it’s a slavish homage, though the source material is obvious. Spencer & Locke is darker, where the child Locke retreated to his fantasy life because real life was just terrible. Abused, neglected, and painfully bright, he grew up to become a police detective. Despite success as an adult, he never let go of his stuffed blue panther companion. Though maybe having Spencer around is how Locke got his success. It’s clear that the cat has better detective skills, and I’ll admit that I always read the reality of Hobbes as inarguable yet vague. Maybe it’s all in Locke’s head, but something more is going on. As the pair investigate the murder of someone close to Locke, Pepose and Santiago hit familiar touchpoints through the lens of their vision. Santiago’s art shifts between comic strip familiarity to a more realistic style, which makes Spencer’s loss of one eye all the more clever a detail — the only thing that stays consistent among his forms. Though laden with none-too-subtle references, the plot moves smoothly. Every detail serves Pepose’s expert noir intent, and even with cute source material, there’s a palpable sense of sadness and loss that balances the cleverness. There are so many points where the book could have done wrong, and it simply doesn’t. 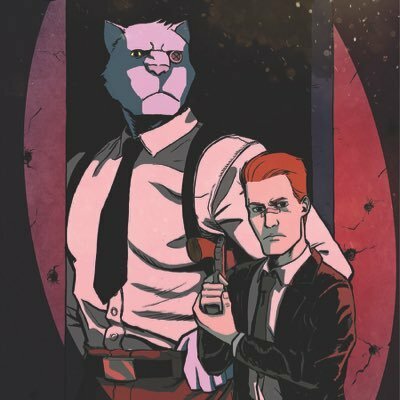 Spencer & Locke got a lot of praise from issue 1, and justifiably so. It’s one of those books that’s every bit as good as people tell you it is, and much better than it needed to be. Publisher Action Lab Entertainment had to move up the publication date of the trade paperback, and it’s obvious why. People need to be reading it now.